“Temporal Turn” exhibit at the Spencer Museum explores contemporary Asian artists’ views of time, history and our global future. The best art inspires us to think differently about things we know; it can also introduce us to things we’ve never dreamed of, like Uterusman, a superhero created by Chinese artist Lu Yang. Brace yourself: Uterusman’s powers derive from the artist’s imaginative re-envisioning of the female reproductive system. Lu, hailed by Art in America as “the prodigiously talented enfant terrible of the Chinese art scene,” demonstrates Uterusman’s powers in a riveting manga-style video, in which he streaks through the galaxy in a pelvic-shaped chariot, wielding weapons that include an umbilical cord whip! Lu’s video is one of 60 works by leading artists from Asia that will be shown in the exhibit, “Temporal Turn,” opening Nov. 10 in newly renovated galleries at KU’s Spencer Museum of Art. Organized by Kris Ercums, the Spencer’s curator of global contemporary and Asian art, the exhibit showcases an Asian perspective in the process of liberating itself from the vestiges of colonialism. And what better symbol for that idea than Jin Shan’s toppled neoclassical column that breathes, a reference to the withering away of the French colonial presence in the city of Shanghai. The subjugation of Asian peoples by European powers was not just about territory and economics. “Colonialism (exerted) political control over the power of knowledge,” Ercums said in a recent interview. Entwined with modernism — and its emphasis on rationalism, order, and ideas of progress governed by linear time — colonialism permeated all aspects of Asian life. The artists in “Temporal Turn” seek to move past this chapter, to reconnect with suppressed aspects of their respective cultures and bring a new “postcolonial” awareness to bear in shaping our global future. “Temporal Turn” offers a time out from Western history, philosophy, religion and pop culture, shining a spotlight on the rich and varied sources mined by contemporary Asian artists. A five-foot wide illuminated clock, created by the New Delhi-based Raqs Media Collective, exemplifies the counter-commentary rife in this exhibit. 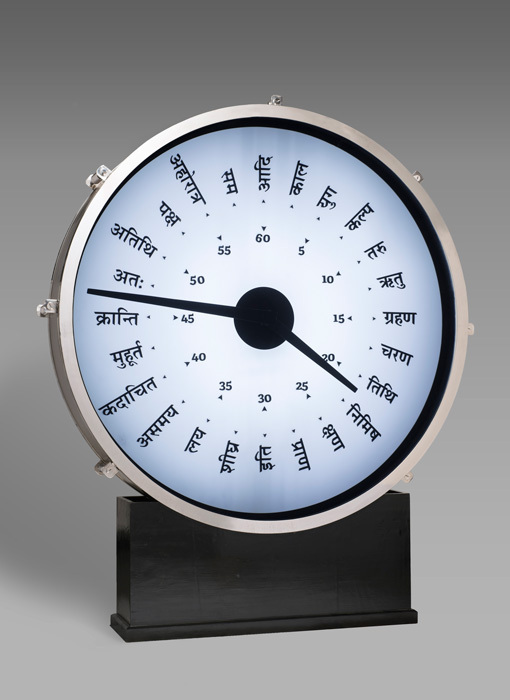 Instead of western numerals, the clock face features 24 words about duration and time written in Hindi. The rush-rush of Western life is suspended as viewers ponder concepts like “taru,” the time it takes for a tree to grow. 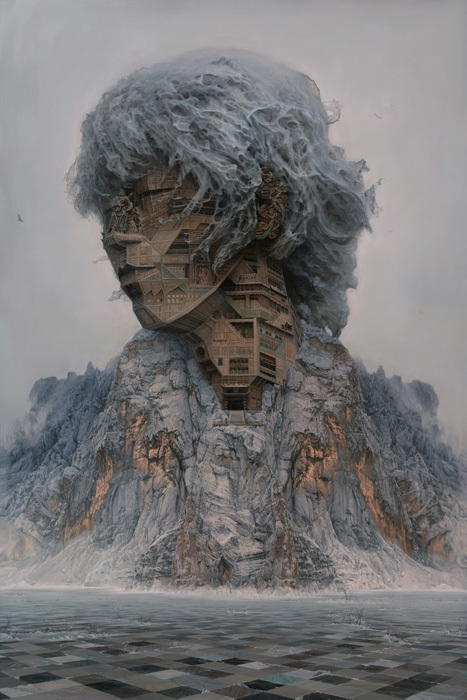 Bound to be a hit with students and scholars alike is Du Kun’s monumental portrait of a Chinese rock star, in which the artist merged the musician’s features with a depiction of a Chinese temple. Park Jaeyoung’s Bokaisen Project Laboratory features a fictitious creature named for the “turtle boat” of Korean military history. German-Iranian artist Timo Nasseri’s fractal-like drawings in white ink on black paper look to ancient Islamic geometric and mathematical formulations. Inspired by a classical Chinese text, Shanghai-based Qiu Anxiong ‘s video, New Book of Mountains and Seas, (2005-2009), offers a whimsical and terrifying commentary on contemporary life and where we are headed. The exhibit features the premiere of part three of the trilogy; it acquired part one in 2009. Science fiction is a key inspiration of many of the works on view, but in these artists’ hands, it has been separated from Western colonialist ideas of subjugating the (alien) Other. Lu’s Uterusman is one example; Park’s boikaisen creature is another. Japanese artist Konoike Tomoko’s mimio-odyssey, an animated work projected onto a blank white book, adds to the sci-fi fray, tracing the adventures of a fuzz ball character, called mimio, and a six-legged wolf, inspired by the extinct Japanese wolf. The wolf makes an even more dramatic appearance in a shimmering, mirror-covered sculptural incarnation created by Tomoko. Tomoko is one of four artists who will create site-specific works for “Temporal Turn.” They include Park Jaeyoung and New Delhi-based Rohini Devasher, who will create a video wall mural in the museum’s Central Court. 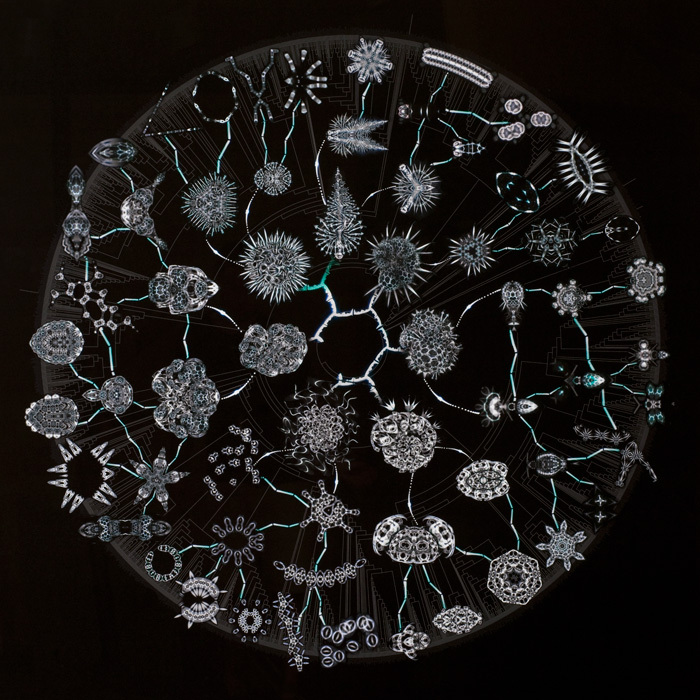 Devasher is known for inventing strange new worlds populated by imaginary biomorphic creatures, as seen in her video work, Bloodlines (2009), one of many pieces in the exhibit that the Spencer has added to the collection. Devasher’s mural in Central Court will include a projected video star map, reflecting her background as an amateur astronomer. Mumbai-based Sahej Rahal will create an installation at the museum’s entrance; inside he will exhibit a video, Forerunner (2013), enacting, Ercums says, “a temporal slippage from ancient shamans far-future Jedis. Several other artists also explore cosmic themes. Korean artist U Sunok used NASA footage in her video The Moon. A video installation by Neha Choksi from India captures the sun endlessly rising and setting. Westerners may feel a sense of liberation while watching these works, in which the concept of beginnings and endings gives way to cyclical notions of time. Throughout this exhibit, the artists are always looking beyond the self, moving between past and present, myth and history, religion and pop culture, science and philosophy, in their search for deep meanings and connections.